Monaco is located about 40 minutes east of Nice. From this view you can see the entire race track used in the Monaco Grand Prix (including the swimming pool). When I first arrived in Monaco i walked this racetrack - the tight turns and the apex (when they leave the tunnel) would have never been fully understood if i hadn't! 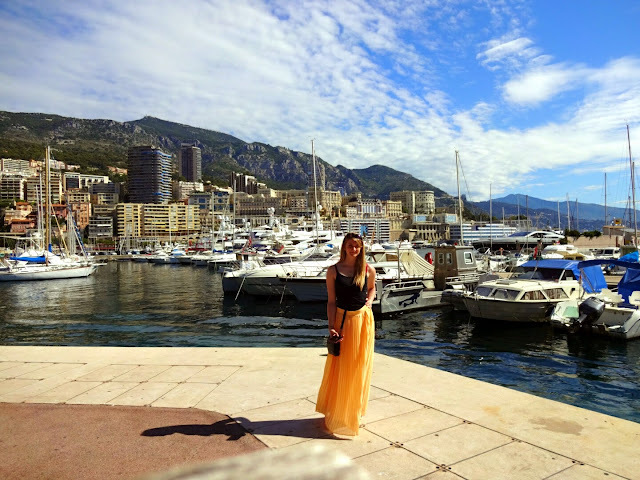 The photo was taken in old Monaco where you will find the Palais Princier. This is where the Royal family of Monaco currently reside and the surrounding area is filled with restaurants and shops. This photo was taken in the Monaco harbour and features a few of the huge cruise liner yachts. When I walked past the larger yachts each had a cleaning crew working on board, but only one of the boats had its owner visible. Do these boats have a crew all year long that work everyday? However, easily my favourite part of Monaco was Monte-Carlo. It really did stand up to its reputation for the glamorous. 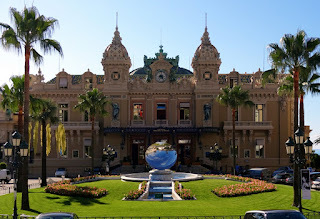 Monte-Carlo Casino was amazing with large rooms, high ceilings and gold leaf covering everything! Not to mention the chandeliers. Several shops were featured outside the casino including a flagship Chanel store. Immediately next to the Casino was the Hotel Du Paris. This Hotel is infamous for its sophistication and class and judging by the cars parked outside, all the rumours about it are true!